We started our day with breakfast at the resort before heading out through some amazing topography. Up and down gorges and through some narrow winding roads. There are plenty of old olive groves and cactus pears growing on the side of the roads. Every village seems to have a road named Umberto I. 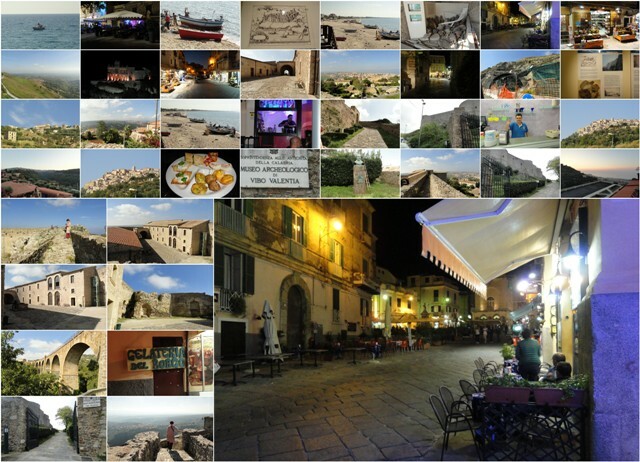 We parked the car in Vibo Valentia and took a walk through the historical town stopping for espresso along the way. We did some grocery shopping and then headed for Vibo Marina. We parked alongside the yacht basin and made rolls with hard boiled eggs and pancetta. We headed back to Tropea, stopping along the way at a market. We also found a harbour with a ruin at the entrance. 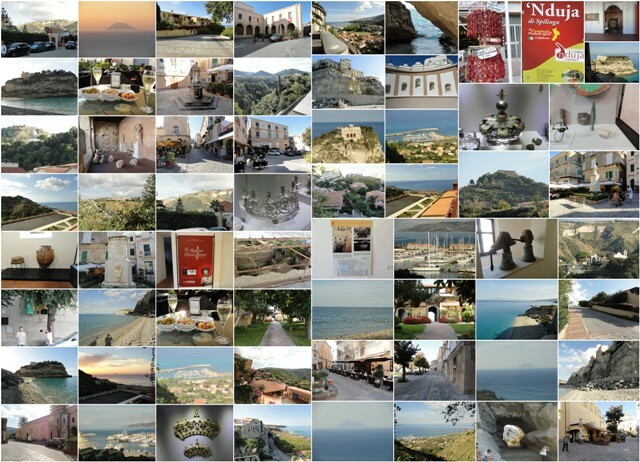 We drove through Tropea and back to the resort where we off loaded the car. We then caught the bus to the shop and got stuff for supper. We stopped for gelato and the shop owner asked if I was a journalist as he noticed me writing down our flavour choices. Dave had limone and I had al gusto di tarrone. He told us his father makes onion ice cream so tomorrow we might brave that! After a nice walk we stopped for prosecco and snacks in the main square before heading back to the resort. Wine tonight is Cirò Rosso Classico 2011. Pasta sauce tonight is chilli, tomato, onion, garlic, cream, valeriana and chorizo served on taglietelle. This was one of the strongest chillies I’ve tasted. I added bocconcini to my pasta to help cool it down, and so did Dave. If he thinks its hot it must be HOT! After dinner snack was crackers with proscuitto, cheese and pesto. The cheese is quite strong and changes the taste of the wine completely. We ended our evening with limoncino. Stromboli is well lit up tonight. Our resort fees are €35 each and include breakfast. After drinking three demi tasse of coffee and reading in bed we showered and headed to the dining room. The breakfast is a buffet with fresh fruit, cereals, yoghurt and breads and cheese. 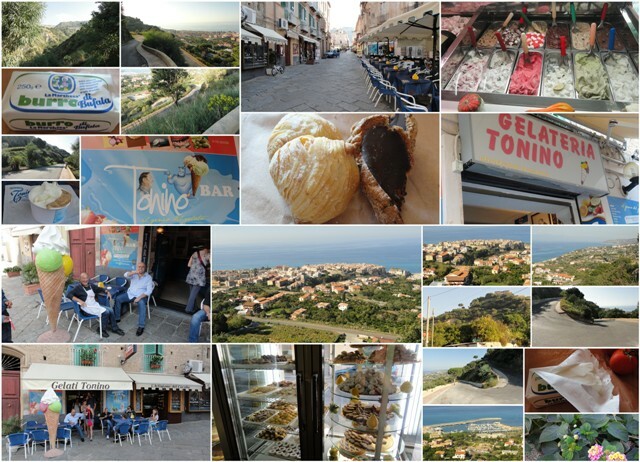 After a double espresso each and tea for me we sorted out emails and then caught the resort bus into Tropea. The bus runs every half hour in the morning and late afternoon and is part of the fees. We walked around and went to the museo dioscesano di Tropea where we saw some amazing bronze artifacts. Dave’s choice of gelato this morning was cioccalata and mine was opera Italiana. We did some grocery shopping and caught the bus back to the resort. Lunch was nduja which is a local piquante sausage like spread, chorizo, bocconcini and tomatoes. After reading for a bit we caught up on the motorbike racing news and then caught the bus to the beach. We walked along the beach and Dave swam in the sea. We then walked up to the old city before having another gelato each. Nocciola for Dave and tartufo for me. After a short walk we had prosecco and snacks in the main square and then caught the bus back to the resort. Wine tonight is Settesoli Syrah 2010. Dinner is tortelloni ricotta e spinaci with a sausage, tomato, zucchini, onion, chilli and garlic sauce. We ended our evening with proscuitto on crackers and the last of the gorgonzola and a limoncino each. Breakfast this morning was typical Italian fare. 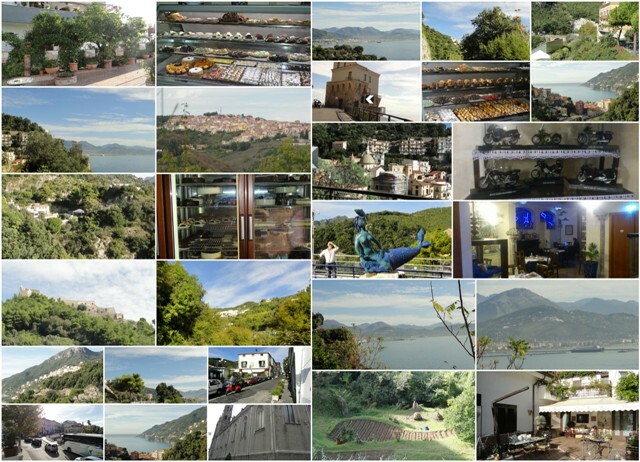 We drove through an amazing village and then headed to Amalfi itself. We did not quite get there before we turned back and had an espresso at Cafe Pasticceria. 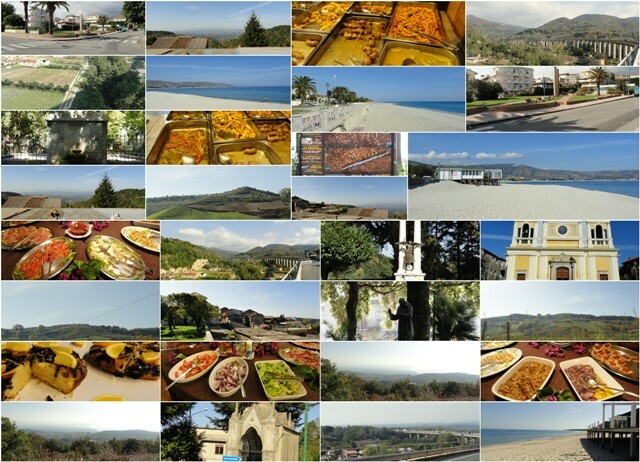 We headed down to Tropea and after spending some time on a major road we explored the long and windy roads. We were 1.5km above sea level at one stage. Lunch was a roll with proscuitto and cheese, put together by the lady behind the deli counter at the shop. 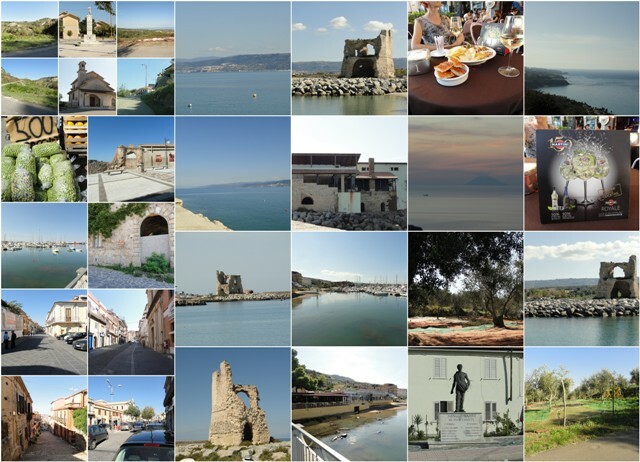 We did our basic grocery shopping and spent some time exploring the vista of southern Italy. This region grows corn and farms buffallo dairy products. One of them being butter which I have bought. We checked into the resort and unpacked before heading to the resort bar for prosecco. Dave made pork sausages with a ragu of tomato, zucchini, garlic and chilli. Wine tonight is Primittivo Salento 2012. We ended our meal with crackers and gorgonzola and a limoncino each.